Aspen Public Radio broadcasts two pieces on Team Marmot! Aspen Public Radio broadcast two pieces about Team Marmot's work: The Marmots of RMBL, and What Marmots Can Teach Us About Plastics. Dana Williams studies alert behavior in marmots. My name is Dana Williams. I grew up in a little town in Western Massachusetts on the border of Vermont, where my grandmother would often take me out into the woods to teach me botany. My parents and I often traveled to western Canada visiting and hiking in areas similar to RMBL. I wanted to return and study in this amazing environment. This coming fall, I will be a senior at Wellesley College. I majoring in Biology with a minor in Environmental Studies. 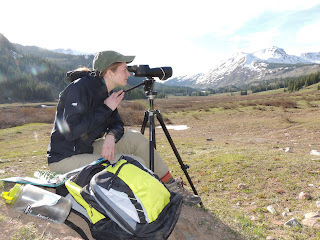 This summer, I got the opportunity to come study with Team Marmot at RMBL. My research this summer is about the potential effects of spontaneous movement on estimates of alert distance. This is all related to economic escape behavior, or when an animal decides it's time to run away. Alert distance is the point during a predator's approach when the prey first acknowledges the predator as a threat. This is followed by a point called the flight initiation distance (FID), where the prey leaves for cover. These measurements of these two help us understand how animals make cost-benefit analyses under predation risk. My project involves being a part of the regular observation team but in addition to recording our two minute "foraging focals", where we observe a foraging animal for two minutes and dictate its actions into a handheld recording device. I am also conducting non-foraging focals for animals at rest and focals before conducting FIDs. The FIDs are measured by walking towards a marmot and marking the alert distance and the flight initiation distance. The marmot project was featured in a story in The Scientist about the value of long-term research.